March 15, 2018 April 23, 2019 by Jonathan R.
We love our WhatsApp conversations, and the long chats and media that comes along with it. However, there can be situations where your dear smartphone lands in trouble like a total breakdown or theft. With the phone lost, you’ve also lost the data, the conversations on the smartphone. 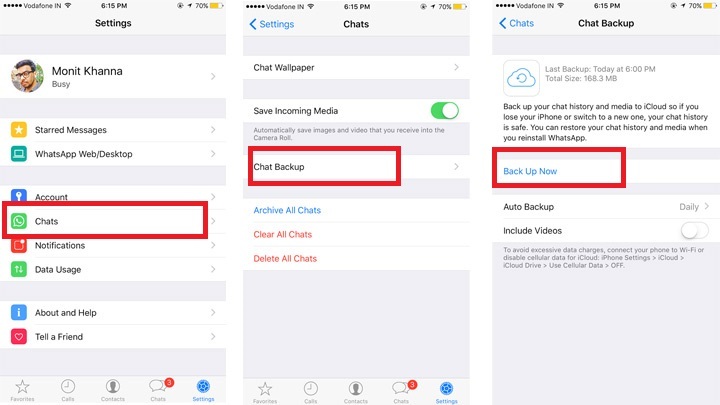 You have Cloud backups which can help you re-start your smartphone setup with contacts stored on the cloud, and your images and videos safe on iCloud or Google Drive, But what about the chat conversations on your beloved messenger? Surprisingly, there is a simple way to retrieve your chats on WhatsApp so that you can begin where you left off (or somewhere close). Here’s how you can recover your conversations on your iOS or Android device. Before you want your messages to be restored, they need to be backed up first. Make sure your WhatsApp account is linked to the Google Drive (or iCloud in case of iOS). To do this, simply head to your Settings, then go to Chats, and then Chat Backup. 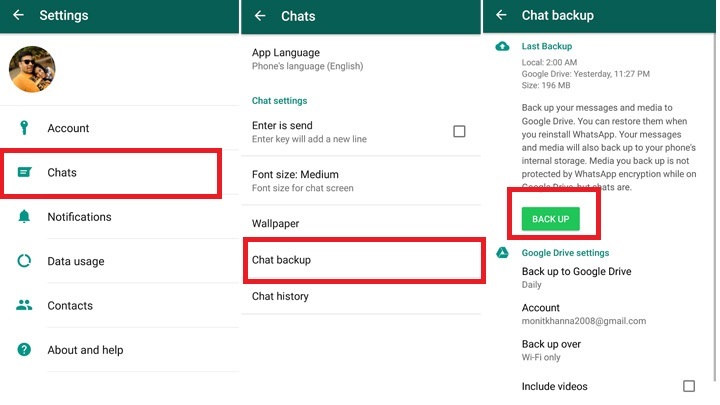 Here you have an option to connect your Google Drive/ iCloud account with the WhatsApp account, and it’ll begin syncing your chats now. The settings also give you option to choose whether you want to sync your videos, as well as the network on which you want to schedule the sync. You can select to sync only on Wi-Fi or Wi-Fi and Mobile Data. All chats get backed up at 2:00 AM (Local time). Now once you’ve begun the backup process, you’re pretty much safe from losing your conversations when your smartphone goes down, or if you’re switching smartphones. If your device runs into trouble, and you’ve got a fresh smartphone with WhatsApp installed, It’ll identify your Gmail account (in case of Android) connected to the Google Drive or iCloud (in case of iOS) on the smartphone, and ask you to restore conversations. In case of Android, just make sure your Google Sync is on while you’re wanting to restore your conversations and you’ll be good to go. However, if it doesn’t pop the notification, you can simply head to the Chat Backup section and tap the restore button to get your conversations back on track. Make sure you have a stable connection for a seamless sync process. The device will be restored to the last backup synced on the smartphone, and you’re pretty much good to go.